(FinalCall.com) - After beginning his research on the AIDS pandemic in 1992, Dr. Boyd Graves discovered in February 1999 the greatest evidence, to date, of records and reports of the experiments that led to the development of what the world now knows as the AIDS virus. That document is the “1971 Flow Chart of the Special Virus Program of the United States.” Dr. Graves submitted this flowchart as evidence to the Sixth Circuit Federal Court in a case which named the President of the United States as a defendant to answer a petition acknowledging the authenticity of the Flow Chart. On January 12, 2001, the case was dismissed as “frivolous,” and then referred to the District’s Appellate Court, which ruled in favor of the lower court. Eventually, it went to the Supreme Court, which refused to hear it without giving comment as to why. Dr. Graves spoke with Final Call contributor Sultan Muhammad to explain the significance and consequences of his research. Sultan Muhammad (SM): What is this flowchart and what does it indicate? 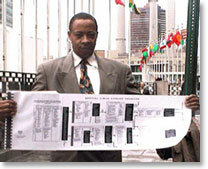 Boyd Graves (BG): The 1971 Flow Chart is the blueprint for the development of AIDS. It is the quintessential missing link document which provides absolute proof of the U.S. origin of HIV/AIDS. It is located in one of the 15 progress reports of the federal program entitled “The U.S. Special Virus Cancer Program.” I believe the term “cancer” was a misnomer to misdirect the actuality of the HIV development. It provides, again, absolute, absolute evidence of the U.S. origin of HIV as a synthetic biological agent. We are currently bringing the lawsuit again with respect to the origin of AIDS/U.S. manufacture of AIDS, vis-à-vis through a federal complaint which we now have pending in the San Diego Federal Court. SM: There have been several other researchers who have said what you have said. However, your research appears to be the most specific and the most conclusive evidence. Why? BG: I believe what you will find with some of the world scientists and medical doctors who have involved themselves in this issue is they have only taken it so far. I believe, maybe, out of fear. I also believe that some of them may, indeed, be a part of the problem as it relates to a blown cover that let some of the air out of the bag, but not all of the air out of the bag. However, any cursory review of the U.S. Special Virus Program—the 15 progress reports—would show conclusively that, indeed, HIV is synthetic. It has been developed over a number of years and it has an affinity for people of color. But the research here, as reflected on my website, www.boydgraves.com, is as extensive as I can possibly make it, so that our people can see the totality of the other side of the development of this agent. SM: When you say affinity to people of color, how is it directed? BG: What the science and medical evidence concludes is that the HIV enzyme seeks out a receptor site in the blood of the Black genome. The receptor site is the CCR5 Delta 32+ (positive) gene that all people of color have. In the same sense, on the other end of the spectrum, is the 15 percent Caucasian population of the world, which is CCR5 Delta 32-(negative) gene. That means that under no circumstances, whether HIV came through the air, intravenous drug usage or any form of the sexual activity, would the virus be transferable in this sector of the world’s population, which is basically of northern European descent. It is speculated by some experts that, in a worse case scenario, 85 percent of the world’s population could potentially perish under these designer viruses and designer synthetic biological agents. What we’re looking at here—because of this identified gene of the Black genome, this CCR5 Delta32+ (positive)—we are potentially looking at the eradication of all people of color. SM: Your statement reminds me of the year 1932, when Mr. Prescott Bush, the grandfather of the current president, convened the first international eugenics conference here in America. I understand this year was significant for other reasons. Could you explain? BG: Many of us are aware that the Tuskegee experiment, where Black sharecroppers were injected intentionally with syphilis for the purposes of infiltrating syphilis into the Black genome. Some 60 years later, we could then say that Black people are scurrilous; syphilis runs rampant throughout Black people and, therefore, they are someone to be placed in a secondary capacity. That is particularly in line with the eugenics program where White births are encouraged and Black births are discouraged. In 1932, the infectious agent of HIV was first tested on sheep in Iceland. That agent is called Visna. In 1932, in conjunction with the Tuskegee syphilis program, they were testing the infectious agent of HIV on an island nation. We have Visna as 30 percent of the sequences of the HIV here today. So, 1932 not only is significant for the start of a push for eugenics, i.e. a White birth order, but also the start of the testing of the infectious agent of HIV in AIDS. SM: Can you give us a timeline of the case that you brought before the federal courts? BG: September of 1998 was the first legal action on this issue and that was even prior to the discovery of the flowchart, which was not until February 1999. We brought this case in the federal court for the purposes of proving and showing the evidence overwhelmingly suggests and concludes that HIV is synthetic. It is also supported in the Congressional Records, in particular House Resolution 15090. The original lawsuit was rejected on the basis that the synthetic origin of AIDS was a frivolous issue. This matter went all the way to the Supreme Court. We are currently bringing the lawsuit again with respect to the origin of AIDS/U.S. manufacture of AIDS, vis-à-vis through a federal complaint which we now have pending in the San Diego Federal Court. This case is with respect to a police kidnapping of me last July, where I was beaten and injected with something and discarded by the police. However, their records show that I was never arrested. The issue there is that I was making irrational statements that the federal government made AIDS. As the experts can clearly show, my statements are not irrational. My website indicates that I have some 30 scientists and medical doctors who have posted their conclusions of my research, and for that I am grateful. Their credentials are impeccable and we believe that this federal case, as it relates to the San Diego police, will allow for this issue to come forth again. We believe we have the strongest case yet, with regard to proving that HIV is synthetic and has been produced by the United States and others. SM: Do you think the program Global 2000 is used in complicity with the U.S. Special Virus Program? I also think it is reflected in the National Security Study Memorandum 200, which was drawn up by Henry Kissinger in 1974 and taken to the World Population Conference held in Bucharest, Romania. It was adopted and approved by many of the nations of the world, including some African puppet government dictators at that time. The Global 2000 plan is a hideous plan that magnifies the Hitler/Jewish Holocaust by about 50 percent with respect to the number of people that have been planned for extermination. Much of that is the Global 2000 plan and the King Alfred Plan. But it was also drawn up in the U.S. Public Law 91-213 that was signed on March 16, 1970 by President Richard Nixon which, in essence, authorizes HIV/AIDS and the development of HIV/AIDS as a matter of Public Law of the United States of America. SM: I want to go back to the federal court case which was refused by the Supreme Court without comment. BG: The case in 2000 was a full disclosure as it relates to the Freedom of Information Act. We were seeking full disclosure of the Special Virus Program vis-à-vis the courts. They were presented with the flowchart document, as well as a May 15, 2000 letter from Dr. Victoria Cargill, the medical officer of the Office of AIDS Research of the National Institute of Health. Dr. Cargill declared in the letter that the flowchart is the flowchart of the human immune deficiency virus. Here, we have an official document from the United States saying the same thing. In May of 2000, it was declared as the flowchart of the immune deficiency virus from the top medical officer of the United States. Yet, the Justice Department merely set the documentation aside. Dr. Cargill located the flowchart, as well as some of the Progress Reports of the Special Virus Program from the archives of the National Cancer Institute and wrote a letter to that effect. She referred this information to the National Cancer Institute to Dr. Allen S. Rabson, who quickly destroyed all the information for a good reason. We found that Dr. Allen S. Rabson, the current deputy director of the National Cancer Institute, was on the 1971 HIV/AIDS developmental committee and his name is located in the Progress Report. SM: There were 15 Progress Reports? BG: Yes, covering 1963 through 1978. Then, we had HIV/AIDS in mass infection in Africa and Manhattan. In Phase V of the flowchart document, you see that the special virus that they were developing was going to be placed in clinical trials. Here we have conclusive proof again that vaccines were complemented, not contaminated. The smallpox vaccine that went to Africa was complemented with the U.S. special virus HIV. Also, they recruited promiscuous White homosexuals in Manhattan—1,068 of them, I believe—and they were all given an experimental Hepatitis B vaccine and that vaccine was also complemented with HIV/AIDS. Therefore, the question to pose for the officials of our government is how a White homosexual disease transforms itself into healthy Black women. Black women are now the fastest growing group with HIV/AIDS today. SM: In Chicago, a few months ago, a young couple went to visit their daughter in a major hospital and found a needle hanging in her leg. The parents had the needle examined and it was found to be laced with AIDS. Would this be among the methods AIDS is administered to victims? BG: Again, we refer back to the 15 Progress Reports of the federal program which details every experiment and every contract. What you find is a conglomeration of colleges, hospitals, medical centers and foundations—all working together for the sole purpose of the development, implementation and proliferation of the HIV virus, through the human genome, primarily the Black genome. Sultan Muhammad (SM): In the early seventies, during the so-called “sickle cell anemia” scare, could the purpose of the blood collection (said to be done to determine if that person had the disease) have been to acquire enough blood from Blacks to use in the study of biological warfare? Boyd Graves (BG): That’s exactly correct. That program was again a part of the Special Virus Program. The program began officially in 1962. However, the research shows that it began a lot longer ago than that. The collection of blood, the tinkering with the Black genome, has been going on throughout the entire 20th century. We have a memorandum from February 1948, Foreign Policy Statement No. 21 written by George W. McKenna, where it states emphatically that the United States has to get over the niceties. That the United States had to develop/devise a scheme to deal with the burgeoning population of the Third World. We further cite a Time magazine article from June 3, 1946, “Better Than The Bomb,” where the May 1946 Appropriation Hearing is discussing a biological agent. We believe that they’re discussing the inducement of visna into the human genome. But we find in the 1971 Progress Report, on page 39, that there is a statement by the United States that visna has not yet been associated with human disease. Today, according to the Journal of American Medical Association (JANA) in a 1987 paper, they conclude that HIV/AIDS evolved from visna. What is shown here are the connection and the nexus of how visna has been manipulated through gene splicing and placed into the human genome so that we would have no natural affinity towards the visna. Indeed, it would be an acquired immune deficiency. So what we find is that this inducement and development of HIV/AIDS, as they proclaim it to be a mystery illness from nature, is, indeed, a designer virus from the laboratories of the United States of America. SM: In reading the June 1969 Senate Subcommittee Hearing on Chemical and Biological Weapons, I was surprised to learn what had been developed during that time. BG: They go into specific detail as it relates to, not only a lethal agent—HIV and AIDS—but also incapacitating agents which we believe have manifested themselves in chronic fatigue syndrome. There is also the Gulf War Illness, where Dr. Garth Nicholson proclaimed is the HIV genome with one gene missing. Therefore, this June 1969 House Resolution 15090 shows that they were working on a synthetic biological agent; in the language of the Pentagon, “an agent that would lead to worldwide scourge or a Black Death type plague.” We believe that they are talking about AIDS. SM: Who is Dr. Robert Gallo? BG: Dr. Robert Gallo is one of the primary scientists involved in the Special Virus Program. He located a human retrovirus, an RNA dependant, DNA polymerase, in 1971. That is in the Progress Report, page 105. This isolation was, and is, a plural effusion from a 5-year-old Black American boy that was used as the entity that all has fused from. It’s the research of Dr. Gallo, coupled with the Special Virus Program, in which he had a green light to do whatever it took to develop a special virus for the purpose of population stabilization. In simpler terms, he received a patent (U.S. Patent No. 4647773) to continue the production of HIV in April 1984. As far back as 1971, he was noted as a project officer. Consequently, President Clinton, before he left the office of the presidency, pardoned Dr. Gallo for any acts relative to this issue. SM: Your research reports that there was/is a cure for AIDS. BG: Absolutely. The Flow Chart has five phases. In Phase IV A are immunological controlled experiments where they developed the inhibitors, the vaccines, as well as the cure for HIV/AIDS before it was released. There is a cure for AIDS patented in, I believe, October 1997, a one-time injection that eradicates the HIV/AIDS in the blood system without any side effects. SM: Were you diagnosed with AIDS? BG: I had a diagnosis. There is some speculation that it might even have been false-positive. There are many conditions. One of the conditions that I had at that time allowed, for Black people in particular, to test false-positive for HIV/AIDS, whereby you were placed on medicines with tremendous side effects. These medicines led to liver failure that killed a number of persons. In November 2001, I took the U.S. patented cure and, for the last 33 months from a physical standpoint, have been in the midst of rejuvenation. Therefore, we do know that the cure is available; it works; we believe it is suppressed simply because not enough people have been killed yet. SM: What is this cure called? BG: Tetrasil. It has a second name, which is Imusil. The patent number is 5676977. SM: Who has the patent on this drug? BG: The patent was issued to Rabbi Dr. Marvin Antelman of Morantech Corporation in Providence, Rhode Island. In my research and contact with Rabbi Dr. Antelman, he told me he had a college relationship with Dr. Gallo, who had stolen something that he and others had been working on. That led me to think that perhaps Dr. Antelman was given the AIDS cure as a payback by Dr. Gallo. There is a connection between the AIDS invention and the AIDS cure patent program. There is a tetra silver that is used in swimming pools. We found a similarity of the blood in your body with respect to the water in a swimming pool. If you put something in a disc in your swimming pool, then all the water becomes clear. The same is true with this one-time injection of purifying the blood in the body. The process is identical to how you purify the water in the swimming pool, and I believe that the swimming pool product is called tetra silver. Dr. Antelman changed the name from Tetrasil to Imusil. SM: Who is Dr. Vincent Gammil? BG: Dr. Gammil is a friend of mine who led me to the Tetrasil. He was also instrumental in supervising Dr. Roberto Munoz, of Mexico, when I received the injection in November 2001. SM: Did you receive the injection in Mexico? BG: No, I received it in Southern California. SM: How were you able to get the drug? BG: The chemical composition of the Tetrasil is Ag4O4 (Silver 4/Oxygen 4). It is a relatively simple compound to make. We could flood Africa with it and bolster the individuals who are suffering and laboring under the throes of HIV and AIDS, so that we have a chance to save the continent. As we speak, the first trials of the cure, Tetrasil, have gotten underway, with only three individuals in Kinshasa taking the injection. A recent report was that the individuals are doing well and are delighted to have had the AIDS cure. Therefore, we know it works and we know that it is suppressed.